Today it appeared that a military attack led by the United States on Syria might at least be delayed after Damascus admitted it possessed chemical weapons and agreed to a Russian plan to put them under international control. President Barack Obama responded by postponing a scheduled vote in the Senate authorising military action against Syria. The Russian Foreign Ministry warned against military intervention, citing last week’s attack on the ancient Christian village of Maaloula, urging “everyone who cares about the fate of the people of Maaloula to do everything possible to prevent their killing and the destruction of Christian holy places”. 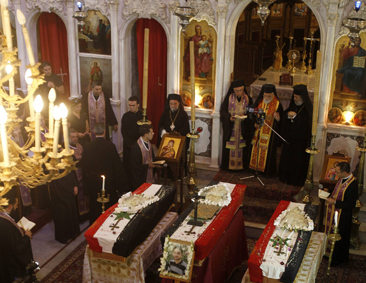 Yesterday Melkite Catholic Patriarch Gregory III Laham (pictured above, centre right with red stole), celebrated the funeral Mass of three Christians in Maaloula who were murdered during a raid by unnamed attackers thought to be Islamic insurgents. AsiaNews reported that six young Greek Catholics were also kidnapped in the attack.